[SatNews] In addition to renewing services for these sites, the African Union added an additional eight international locations, for a total of 28 global sites. Emerging Markets Communications (EMC) announced that the African Union Commission (AUC) has expanded its connectivity services with the company in Africa and renewed its existing contract. Over the past eight years, EMC has provided satellite communication services to the African Union in 20 countries throughout Africa for their corporate offices and remote locations. In addition to renewing services for these sites, the African Union added an additional eight international locations, for a total of 28 global sites. EMC provides connectivity for private data, internet, voice and high definition video using HD Connect. "EMC has been instrumental in supporting the African Union's mission over the last eight years," said Rekia Mahamoudou, Division Head at African Union. "EMC's investments in local field support, satellite capacity, teleports and in-country inventory in Africa enables us to expand our operations to achieve our goals of promoting unity and solidarity among African states, coordinating the cooperation for development, and safeguard of the sovereignty and integrity of the Member States," said Mrs. Mahamoudou. "We chose to continue and expand our connectivity services with EMC as a result of their consistent, reliable network performance and 24 x 7 support." The African Union Commission (AUC) is an institution spread throughout Africa with a mission to efficiently drive African integration and development in collaboration with African Union Member States, the Regional Economic Communities and African citizens. Through a strong infrastructure spanning 54 countries, the commission encourages diversity, teamwork, transparency, information sharing and maintains a high level of integrity to put the needs of Africa above all else. "EMC's communications infrastructure throughout Africa in satellite capacity, fiber, teleports, in-country field support centers and locally hired engineers provides organizations such as the African Union the access to quick-deployed connectivity solutions," said Joe Kamau, Senior Vice President, African Business at Emerging Markets Communications. "We are excited to continue our eight year relationship with the African Union and look forward to supporting their growth internationally." Emerging Markets Communications is a provider of fully managed satellite and terrestrial connectivity solutions to all 54 countries in Africa. The company has 21 field support locations throughout Africa, staffed with locally hired engineers and an inventory of spare parts. 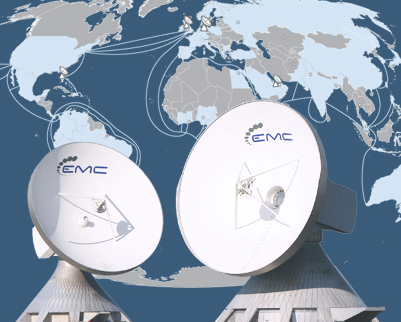 In addition to its C-Band satellite capacity, EMC has a corporate office and teleport in Nairobi, Kenya. Emerging Markets Communications® is a global satellite and terrestrial communications company specializing in delivering mission-critical, network services for the global energy industry, maritime, mobile network operators, carriers, governments, NGOs and worldwide enterprises with locations in the most remote and/or challenging areas of the world. As a proven industry leader, Emerging Markets Communications® enables customers the agility, scalability and efficiency designed to facilitate growth for their global operations. The company operates in 150 countries, with 41 global field support centers and wholly-owned infrastructure of teleports and terrestrial pops in the U.S., Europe and Africa. Emerging Markets Communications® is financially backed by ABRY Partners; a firm specialized in funding the communications industry with $36 billion of completed transactions.